TOORAK TOFF (AUS) (Chestnut 2007-Stud 2012). 6 wins-3 at 2-to 1400m, MRC Sir Rupert Clarke S., Gr.1. Sire of 154 rnrs, 79 wnrs, inc. SW Iconoclasm (MRC Weekend Hussler H., L), SP Toffee Nose and of Social Spin, Duality, Embezzlement, Toorak Comedy, Trakiato, Greywolf, Knock Toff, Speedy King, Strathclyde, Toorak Affair, Toorak Cowboy, Toorak Tower, Arriba, Gypsy Toff, Ship Creek, Toorak Smock, Dellacqua, Miss Toorak Flyer, Washington Street, etc. Chasse (g. by Octagonal). 5 wins from 1200m to 2000m, A$349,235, VRC Spotless H., MRC BTB Australia Directional Drilling H., Shadwell Estate Co UK H., 2d MRC Sandown Guineas, Gr.2, VRC National Jockeys Trust H., MVRC Gillies Famous Pies H., VRC SES Victorian Volunteers H., Festival of Racing H., 3d VRC Hiraji H., Bruce Gadsden H., Mittys H., MRC Betfair H., VRC Victoria University H., Williamstown H., 4th ATC South Pacific H., L, Hawkesbury Guineas, L.
Social Spin (g. by Toorak Toff). 4 wins. See below. Teretto. 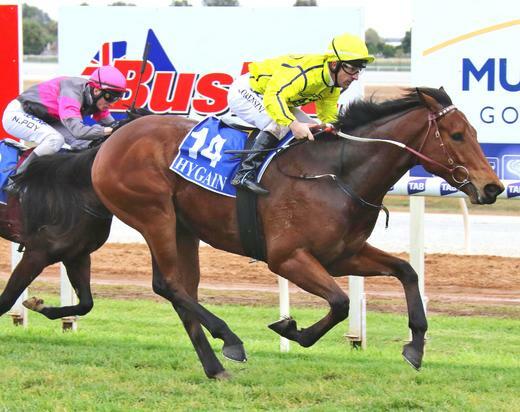 Winner at 1050m in Aust. Shamrock Son - Absolutely Good (Sing.) (Charnwood Forest). Winner at 1200m, WATC Auswines H., 2d WATC Del Basso Smallgoods Clear Mak P., Great Western 2YO H., 3d WATC Sir Ernest Lee Steere Classic S., Gr.3, Raconteur S., L, 4th WATC Aquanita S., L.
Race Record: 9 Starts 4-3-0 A$321,575. 4 wins-2 at 2-at 1000m, 1400m, A$321,575, to 2018-19, MRC Ladbrokes Protest Payout 2YO H., VRC Summer Racing H., MRC Catanach's Jewellers H., 2d VRC Sports Alliance H., MVRC Santa's Workshop H., SAJC M&J Chickens 2YO H.